University Of Iowa Press, 9781609381264, 152pp. 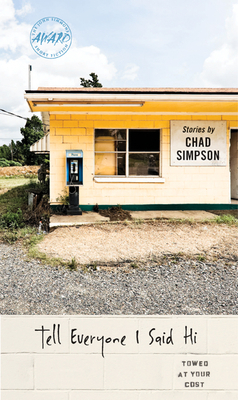 Chad Simpson was raised in Monmouth, Illinois, and Logansport, Indiana. His work has appeared in McSweeney’s Quarterly, Esquire, American Short Fiction, The Sun, and many other print and online publications. He is the recipient of a fellowship in prose from the Illinois Arts Council and scholarships from the Bread Loaf and Sewanee Writers’ conferences. He teaches at Knox College in Galesburg, Illinois, where he received the Philip Green Wright/Lombard College Prize for Distinguished Teaching in 2010.